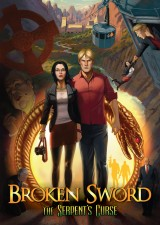 Broken Sword 5: The Serpent's Curse is the fifth installment in the Broken Sword series. It was funded by fans through the crowd funding site Kickstarter. It is the first installment to be created completely by Revolution since Broken Sword 2. It is also the first game to be presented in a 2D style since that game as well. However, unlike Broken Sword 2, and its predecessor Broken Sword, Broken Sword 5 will be presented in a 2.5 dimensional style with hand drawn backgrounds and 3D modeled characters. The game was released in two parts. The first part was released in December 2013 for PC, Mac, Linux, and PlayStation Vita, in February 2014 for iOS, and on Android in March 2014. The second part was released for PC, Mac, and Linux in April 2014, with the Vita, iOS, and Android versions following shortly afterward. George and Nico meet at a Parisian art gallery, and witness a murder of a man over the least expensive painting there. The pair continue their investigation, which leads them to a conspiracy involving the Gnostic Gospels.